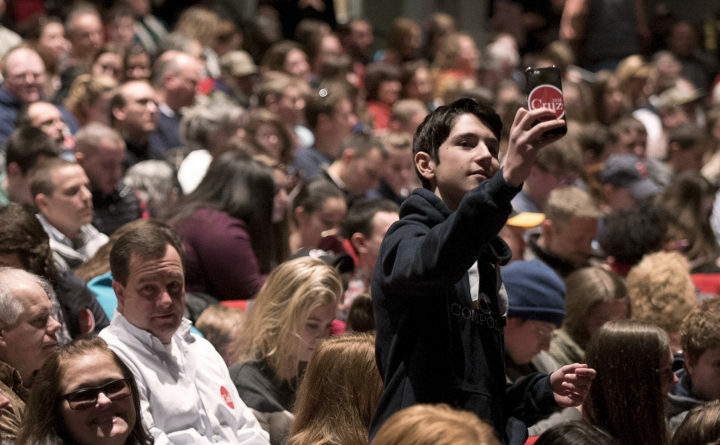 In this March 2016 file photo, a supporter takes a selfie during Republican presidential candidate Sen. Ted Cruz during a campaign ralley at the University of Maine in Orono Friday. The University of Maine System board of trustees unanimously approved a contentious political activity policy during its meeting Monday, despite faculty and student representatives’ pleas for another delay. The proposal sparked controversy when an early draft started circulating among faculty members late last year. The aim of the policy on “Institutional Authority on Political Matters,” was to prevent university employees from participating in partisan political advocacy while on the clock or using university resources. Faculty members worried the way the policy was written left the door open to restrictions on free speech and academic freedom. Jim Thelen, the university system’s general counsel, gave the policy two major rewrites after visiting with faculty groups on several campuses, but it wasn’t enough to quell all concerns. Uriah Anderson, a professor at the University of Maine at Machias who serves as a faculty representative to the board, called on trustees to postpone their vote on the policy until their May meeting to allow more vetting time. He said that school vacations have made it difficult to organize, review and recommend changes to the policy as a group. Thelen argued this process has been “a shining example of engagement,” and said that even after a two-month delay, the language likely wouldn’t adjust much further. “I would not suggest or recommend any changes to the policy that we now have before you,” he told trustees before their vote. The review and alteration process for the policy had stretched to 120 days as of Monday’s vote, and the system had made a “good-faith effort” to address concerns, he said. System officials say they’ll be monitoring the campuses to see if any problems arise as a result of the policy’s language, and will consider any necessary changes in the future. The system runs the risk of losing tax-exempt status if employees start taking stances on political issues without making it clear they aren’t speaking on behalf of the university, system officials have argued. System and university officials say they’re pleased with early results of a push to boost enrollment at the state’s smaller campuses by covering the costs of tuition and mandatory fees for some in-state students attending college for the first time. Starting in January, University of Maine system campuses at Presque Isle, Fort Kent, Augusta and Machias started building financial aid plans for any first-year students who qualify for a federal Pell grant to cover the cost of tuition and fees that aren’t already covered by grants. So far, the four campuses have handed out full financial aid awards to 300 students. The program was rolled out originally at UMPI. Pell grants are issued to undergraduate students working on their first bachelor’s degree to help cover a portion of the cost of attending school. Unlike a loan, Pell grants don’t have to be repaid after a student graduates. Pell seldom covers the entire cost of attending universities, so students often turn to loans to cover the remainder. There are a few conditions. Eligible students supported through the program must commit to taking at least 30 credits per year — putting them on track to earn their four-year degree in four years — and they’ll have to maintain a 2.0 grade point average. If they fail to meet those requirements, they’ll retain their federal Pell Grant funding, but some of the campus-based financial support might be at risk. Students may have other costs to cover on their own. For example, they’ll have to buy books required for their classes and, if they choose to live on campus, they’ll still have to pay for room and board and a meal plan.